A group of north-east youngsters enjoyed a trip to the cinema with a difference at the weekend – when they watched themselves starring on the big screen. 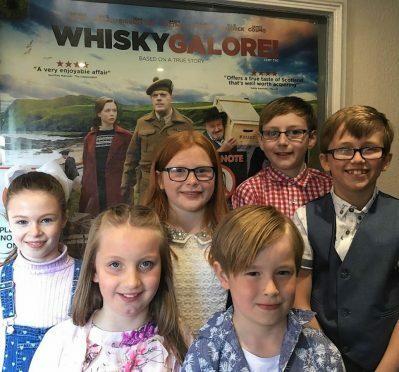 Children from towns and villages across the region organised a special outing to the Moray Playhouse in Elgin to watch the newly-released comedy Whisky Galore. Much of the movie was filmed along the area’s picturesque coastline, with the bulk of the action taking place in Portsoy. And the filmmakers didn’t have to look far to find budding young performers who were willing to take on small but important roles. Children from Portsoy, Findochty, Buckie and Turriff ended up rubbing shoulders with leading luminaries such as Eddie Izzard and Gregor Fisher while the movie was being made. And those youngsters were abuzz with excitement when they took their seats in a booth at the Elgin cinema to enjoy the fruits of their labours. One of the stars in the young cast was Portsoy nine-year-old, Alex Mathieson, who acted as Young Neil. The character plays an important part in the proceedings by using flag signals to help advise the men on when it is safe to hide their ill-gotten alcohol stash. He was joined by fellow Portsoy resident Emma Duncan, nine, Findochty eight-year-old, Joseph Humphrey, and Buckie 10-year-olds, Hollie Smith and Kallum Aitchison. Camryn Mackie, also 10, had ventured north from Turriff with her family for the screening. The excited youngsters were on their best behaviour during the movie, but let out a loud cheer at the end when a clip of Alex was shown in the closing credits. Afterwards, the Portsoy youngster said it was “exciting” seeing himself on the silver screen. Joseph said he planned to buy the DVD of the movie upon its release. The movie is a remake of the 1949 Ealing comedy, which was based on the 1947 novel by Compton Mackenzie of the same name.